One of the oldest stops along the South Pacific Coast Railroad route was known throughout most of its life as Rincon. It was located on a flat clearing midway between Felton and Santa Cruz above the San Lorenzo River. The location first came into use under the name Summit because of its placement on a rare level plain along an otherwise sharp downhill slope. The name "Rincon" is an Anglicized shortening of the name of the rancho, Rancho la Cañada del Rincón en el Rio San Lorenzo de Santa Cruz. In English, that name roughly translates to "Ranch in the Gorge of the Bend in the San Lorenzo River of Santa Cruz." A mouthful to be sure. This bend still exists, just north of Paradise Park along the river. 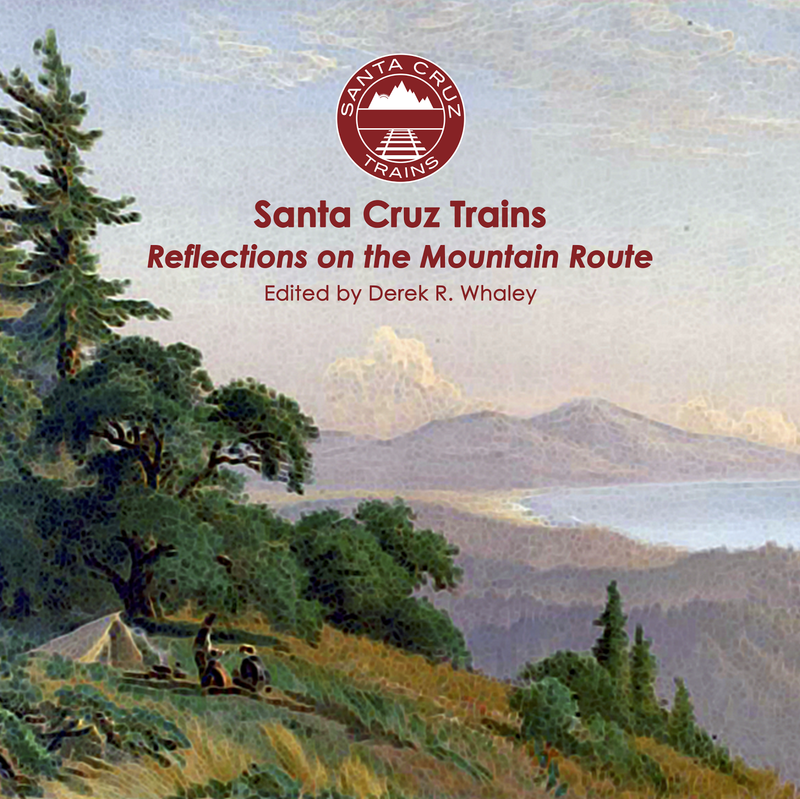 When the Santa Cruz & Felton Railroad began grading the line through the mountains in 1874, a siding and station were created under the name El Rincón. When the first official SC&F RR maps were produced the name had already become Summit, although the site was the summit of no hill. When the South Pacific Coast purchased all the rights to the SC&F RR in 1879, it renamed the location Rincón. The station first appeared on a passenger timetable in 1883 under the name Summit and located 76.9 miles south of San Francisco via Alameda Point. By 1889, the name was Rincon and its distance to San Francisco was revised to 77 miles. A few years later, it had balanced at 76.8 miles. It appeared off and on the timetables through from the 1890s to 1932 when it made a penultimate appearance. This matches evidence that the station was still in use in 1929. It made its final appearance on the proposed 1940 timetable between Big Trees and Eblis. 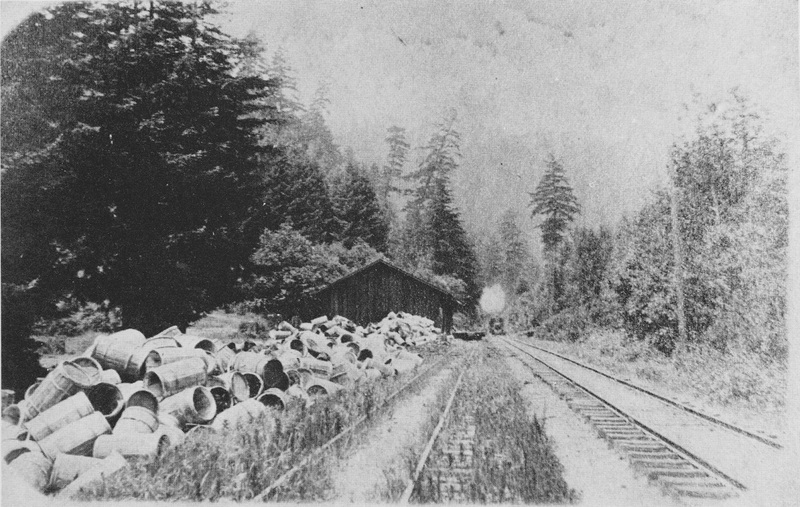 The site was used mostly as a siding during its early years, with the 1899 Station Book noting it as having a full service water tower siding station and a platform on the right, but it was probably little used in this time except to give trains a rest and perhaps as a minor picnicking stop for impatient tourists eager to view the Redwoods. background is the original warehouse. In two years, the full Cowell Lime Kiln facility would be built on this site. From the 1900s onwards, Rincón was mostly used as a freight stop attached to the nearby Henry Cowell Lime & Cement Company kilns. The lime quarry was located almost two miles away in the woods behind Pogonip City Park. Originally, treated lime was trucked to the site and left in a warehouse that was built alongside the track in 1907. Cowell began actual refining of limestone using kilns at the location in 1909, and continued refining and shipping from the site into the 1940s. Cowell rarely used the Railroad Wharf to ship his lime, preferring instead to ship directly over the mountain via rail. At its height, four 34-foot kilns were built at Rincon. The plant remained in use through World War II, but only 15 men were employed by the company at the end. Few passengers are likely to have called at the site other than freight workers once the lime kilns were built. It was in service for the entire time that the Mountain Route was in service, as well as a bit before and after. Its final year of operation was around 1947. The siding built at Rincon was probably used by the cement plant in Olympia even after lime operations at Rincon ceased although the siding has since been removed, perhaps during the late 1980s when much of the freight yard in Santa Cruz was torn up. why the side here is so clear. It is likely the siding wasn't removed until the late 1970s or even the 1980s. 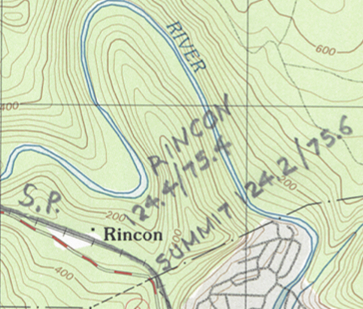 The site of Rincon today is easily accessible. It is at the south border of Henry Cowell Redwoods State Park along Highway 9. There is a large pullout on the river side of the road just north of the place where the tracks cross the road. That site all the way to the tracks was the site of the lime kilns. Where all the poison oak is beside the tracks, that's the site of the warehouse and platform for Rincon Station. Today it is a popular place to hike down to the river for fishing or to pick up trails that go to UC Santa Cruz or the river. 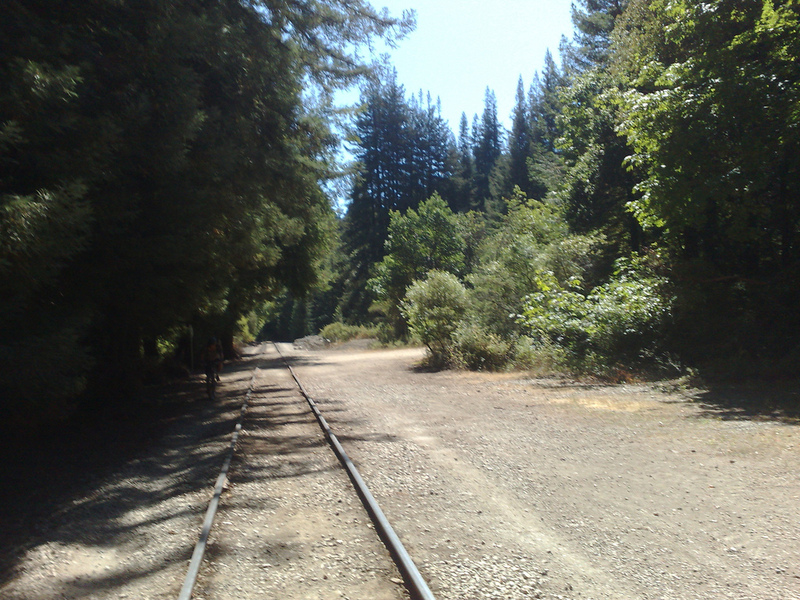 The tracks are still used every day in the summer by the Santa Cruz Big Trees & Pacific Railway tourist train run by Roaring Camp Railroads, though its days as a railroad station are long gone. The history of Rincon Tunnel (SPC Tunnel #7) was short and brief. It was constructed around 1874 and was daylighted in 1896 when its ceiling proved to be unstable. This daylighting may have coincided with the anticipated broad-gauging of the line that would occur around a decade later. The tunnel was only 282' long and was intended for narrow gauge trains. It was located midway between Rincon Station and the Powder Works trestle. 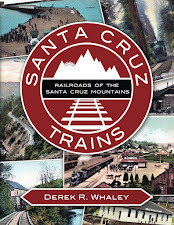 Today the site can be visited by walking south along the tracks toward Santa Cruz. When the walls alongside the track rise up, that is the site of the Rincon Tunnel. There are no known historical photographs of this tunnel. Logan, Clarence A. "Limestone in California". California Journal of Mines and Geology, Vol. 43, No. 3. July 1947. California Division of Mines, San Francisco, California. Pages 175-357. Peery, Frank A., Robert W. Piwarzyk, and Allan Molho. "Getting the Lime to Market." Lime Kiln Legacies: The History of the Lime Industry in Santa Cruz County. Santa Cruz, CA: The Museum of Art & History at the McPherson Center, 2007. Pgs. 150-155. Southern Pacific System: List of Officers, Agencies and Stations, 1899. Your picture there of "rincon tunnel" sure looks like the shoo fly around the other tunnel up by the arch and the hogsback. The rincon tunnel was as you describe, south of rincon near the highway 9 crossing. The shoo fly where the tracks are now is actually the original SC&F alignment, and the SP built the tunnel to ease the curve there. It burned after RC owned it. They didnt daylight it because the ground is really unstable there, hence the long cement retaining wall still visible on the south side of the tunnel. It's possible it is the wrong area; I didn't take this photograph myself. I am planning to hike this area of the tracks again and take some photos, so I will confirm or change the photo when I find out. Lisa seemed to know where I was talking about, but she may have been more confused than she realized. I have since confirmed that the above photograph is indeed of the cite of the Rincon Tunnel. Its likeness to the other tunnel is pure coincidence.